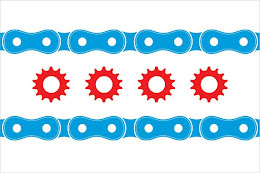 Chicago's cyclists should be excited for the expansion of protected lanes and bike facilities throughout the city as a part of the Streets for Cycling Plan 2020, also known as the "Bike 2020 Plan." Bike-share stations will figure prominently in the landscape of Chicago of 2020. Gabe Klein, commissioner of the Chicago Department of Transportation predicts Chicago to be dotted with thousands of bike-share stations, holding over ten thousand bikes available for public use. Embracing this comprehensive approach to increasing ridership in Chicago, the 2020 Plan integrates new and existing technologies together, the public sector with the private. Bike-share stations will be integrated into the existing public transportation network of buses and trains, giving users the flexibility and the option to choose their mode of transport. City planners are proceeding with the expectation that smartphone and web-based applications will provide real-time information to users as to the locations and numbers of bike-share bikes at specific locations. Central to the expansion of bike-share stations is the collaboration with the private sector, companies like Chicago's own iGo. iGo, a non-profit car sharing firm, hopes to expand their user base to cyclists as well by building bike-share stations that not only provide standard bicycles but also cargo bicycles and electric-assisted bicycles. All of these measures amount to increasing the practicality of using bikes in the city. The Bike 2020 Plan sounds very promising for all skill levels of cyclists. Increasing access to safe routes while simultaneously increasing the number of riders will help reduce interactions with motor vehicles, thus significantly decreasing the potential for bicycle collisions and bicycle accidents.The Illinois Bicycle Lawyers at Keating Law Offices support Chicago's efforts to increase ridership and to make bicycling more accessible.